And it was the same for me, well, most of the times! My Amma’s principle was very simple when it came to eating; respect the food that has been cooked for you. If you don’t like what is cooked for whole family then you as cook something yourself or go hungry! She would gently but firmly ask us to try every vegetable or fruits before saying no to them. Well, when I think of it now I can’t help but agree to her point as many a times what I thought to be uneatable turned out to be one of the tastiest foods I have ever tasted! Yeah, yeah… Mothers know best! In spite of being stubborn and fussy eater for most of my childhood, my parents always made sure that my fussiness remained within four walls of our home as I was expected to behave and eat properly when we visited our friends and family! My Amma is known for her wonderful culinary skills among our family and friends. Her kitchen is a magical wonderland where she churns one pot of delicious food after another with ease and, of course, love! While everyone licked their plates clean, praising my amma’s culinary ingenuity, I for some strange reasons preferred and liked whatever my aunts or mom’s friends cooked! For me the simple dal or rasams cooked by them would always taste better than my amma’s cooking! As wise people rightly say “Ghar ki murgi dal barabar”, for some of us everything tastes better that is not home cooked!!! And the saga would have continued if not for moving away from home and staying at hostel. First few days of hostel life was wonderful… if you don’t like what’s cooked in hostel mess, just hop to nearest restaurant and order your favourite food! Samosas or pizzas for breakfast? No problem… Big tub of ice cream for lunch? Go ahead… Gol gappa, Bhel puri or cups after cups of Cappuccinos for dinner? Who is stopping you???? Apart from mom's cooking, other thing I missed after coming to UK is some familiar vegetables that are exclusive to Indian cooking. 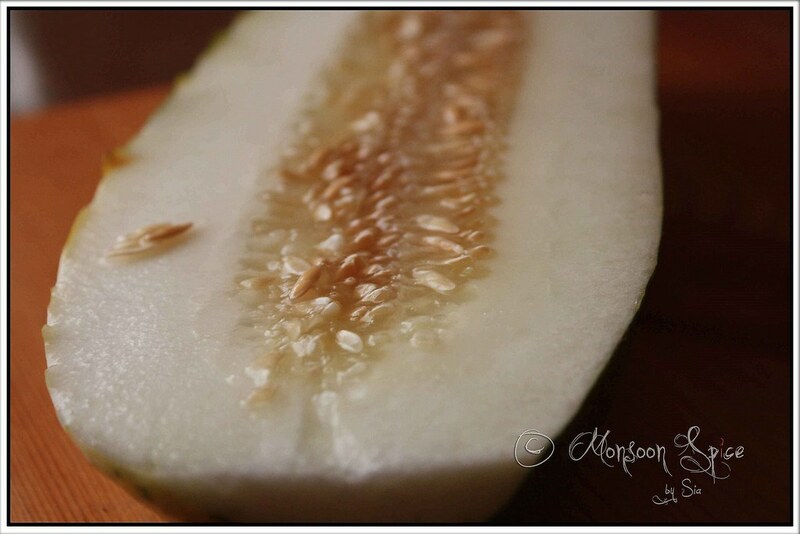 One such vegetable was Yellow Cucumber, also called as Dosakai in Telugu and Soutekai in Kannada. Few months back one giant Asian supermarket was launched in close by town and we have been fortunate to find some authentic south Indian vegetables and fruits on fresh vegetable and fruits section. Although these yellow cucumbers cost a bomb, I feel fortunate to get them fresh and readily available whenever my heart desires to eat something I grew up eating (and sometime hating!!! Now I know better!). These yellow cucumbers are generally spherical in shape and have shades of yellow & green coloured skin. It is commonly added in Sambar (Thick lentil soup with vegetable), Daal (Lentil soup) and also in making Pickles and Chutney. There is one another recipe from my native that makes the best use of this cucumber and it is called Soutekai Rotti. The following recipe for Soutekai Rotti comes from my mom-in-law who makes one the best Soutekai Rotti which is quite different from what my Ajji and Amma make back at home. While my Ajji and Amma would grate the cucumber, my Atte grinds them along with rice soaked in water along with some spices. Lightly dry roasted coriander seeds, cumin seeds add heady aroma to the Rotti when cooked and the dry roasted red chillies gives this rotti a spicy twist. Handful of fresh coriander leaves, finely chopped red onions and curry leaves lends some crunch, aroma and flavour to this already delicious rotti and ground fresh coconut simply enhances the flavour and takes the taste level to new height! If you are lucky enough to get hold of this yellow cucumber, give this recipe a try and see your heart, stomach and soul falling in love with this simple, delightful recipe! This goes to RCI: Udupi & Mangalorean Cuisine hosted by yours truly. Dry roast coriander seeds, cumin seeds and dry red chillies on medium flame till the spices turn light golden red in colour, about 2 minutes. Let it cool slightly. Transfer soaked rice, roasted spices, tamarind pulp/paste and cucumber cubes into a food processor or mixer grinder and grind them to thick batter (consistency should be that of an Idli batter) adding little water at time. Do this in 2-3 batches for better result. Transfer the contents into a large vessel and leave it covered on a warm place over night for the batter to ferment. Next morning, grind coconut to fine paste adding very little water and add this to the prepared, fermented batter and mix well. Also add finely chopped onions, curry leaves and coriander leaves along with salt to taste and mix them well. 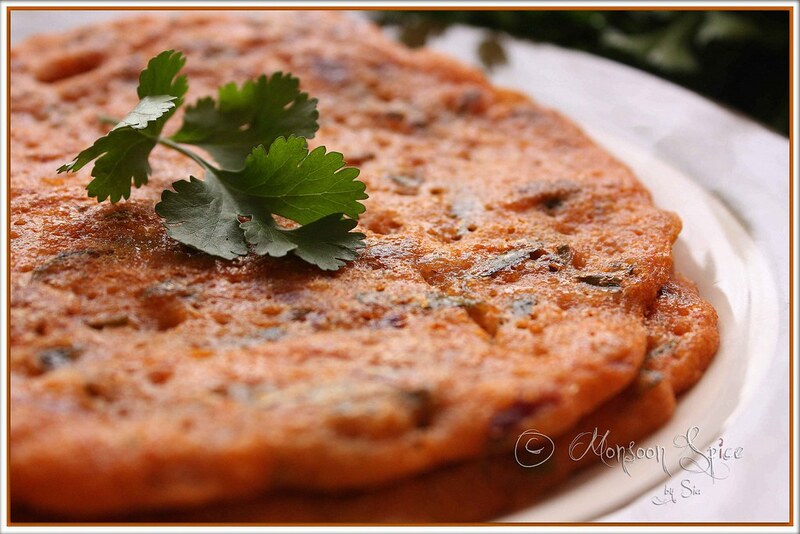 Let it rest for 20-30 minutes for the flavours to blend well before proceeding to make Rotti. The best type of griddle or tawa for making this rotti is cast iron as it not only gives crisp texture to the rotti but also gives it a distinct taste. If you don’t have cast iron tawa then you can use normal non-stick griddle or pan. Heat cast iron tawa/griddle on medium to high flame. Drizzle a tsp or two of oil and grease the tawa well. To grease the tawa, fold the paper towel into a wad and dip it into a bowl of cooking oil. Gently squeeze the wad to remove excess oil and rub it all over the griddle to grease it. Or, cut peeled onion in half. Pour a tsp of oil in the centre of griddle and use halved onion and rub it all over the griddle. Back in my native, we use dried yellow pumpkin stem to grease the griddle. When tawa is hot enough reduce the heat to medium. Take about ¾ cup of batter in a ladle and pour it on the centre of tawa. Spread this batter into thick circle, of about 6-7 inch in diameter and about ¾-1 cm thick, with back of the ladle. Cover the griddle with lid and let cook undisturbed for 3-4 minutes. Open the lid and drizzle a tsp or more of oil/Ghee on the surface of Rotti and also around its edges and let it cook for another minute till its upper surface is cooked well (it should look cooked and shouldn’t be soft or runny). Using wooden (for non-stick griddle) or metal (for cast iron griddle) spatula, carefully remove the Rotti from griddle and flip it. Ideally, the cooked surface should have turned golden brown in colour and crisp. Allow other side to cook for a minute or two after flipping. Once cooked on both sides, transfer the Rotti to clean and dry plate. Repeat the same procedure to make Rotti. Grease the griddle (if using cast-iron tawa), pour the batter, spread it in circular motion, cover and cook, drizzle oil/ghee, flip and cook and serve! 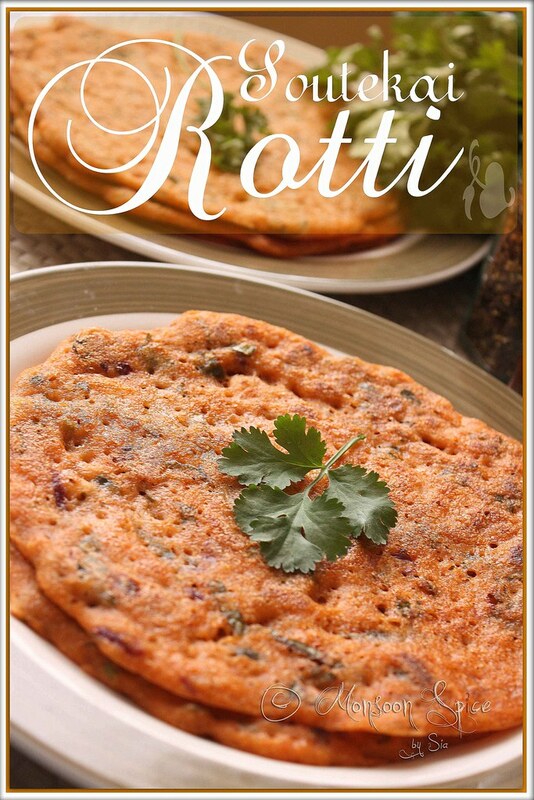 Serve this spicy and delicious Soutekai Rotti as it is as it usually doesn’t require any side dish. I like to dip in little honey and eat or you can also serve some chutney of your choice and enjoy! It is best to serve Soutekai Rotti immediately as soon as they are taken out from tawa to enjoy the crisp and delicious Rotti. You can also make a stack of Rotti and serve later, just like pancakes. Just ensure to keep the Rottis warm till you serve them in a closed dish. However, these Rottis will not be as crisp as the ones you serve immediately. After exploring many states and regions around our beloved motherland, this month I am honoured to take you all to my native land to sample and devour one of the finest cuisines. The RCI for the month of July’09 is RCI-Udupi & Mangalorean Cuisine! Let's explore the hidden gems of beautiful temple town of Udupi and gorgeous coastal city of Mangalore all this month. New to me, never made rotti with cucumber and rice, love the color! very nice idea... would love to try!looks very pleasing. Love rottis, am sure this one will be loved as well. Just have to get hold of that southekai. Looks perfect with the golden honey.. I made this last week, but with cucumber and how i miss that yellow southekai! I too was a very fussy eater and guess what i never used to like yellow southekai! and now craving for it!!! Your rottis look too good! Oh this looks so delicious! I agree with you..moms recipes are always precious! I live in Canada and I agree with you it sure costs a bomb! But I know it as Mangalore sowthekai and I only know that we make sambar, gojju or sasuve out of it. This is new..But while this recipe looks interesting, it is more kind of dosa, than rotti don't you think? Even though it has the name of rotti.. anways, it looks nice. By the way, instead of grinding it fine, you can keep it coarse and steam it like idli too.. I guess, this is only my creativity. I don't know if this works.. I follow a similar recipe for cabbage idli and it tastes delicious. Thanks for the recipe. The photos are nice too. I live in Canada and I sure agree with you that this vegetable costs a bomb. I know this vegetable as Mangalore Sowthekai as I am from Bangalore. I remember that they used to make Sambar, gojju, or sasuve out of it. We also do majjigehuli just like any ordinary sowthekai. While this recipe is nice, it looks more like a dosa instead of a rotti even though it has the name of rotti.. don't youthink? Instead of grinding it fine, you can leave it coarse and steam it like idlis.. it is my creativity and I don't know if this works. I follow a similar recipe for making Cabbage idlis and it tastes delicious. Wow.. never tried Cucumber rotti, was only familiar with dosa...Looks delicious..
Sia, i have mailed you my entries again. Delicious looking roti, Supriya! I've never tried this vegetable before. Does it taste at all like cucumber? Your blog proves WP is not all that :). I feel like my struggle with my own was effortless. The question is: How can the average person not of Indian heritage recognize individual Indian Cuisines or at least what makes each unique? Is there any particular post anyone has written that easily explains it? Plantain Leaf did explain in a recent recipe that Mangalore uses coconut oil rather gourd nut or sunflower oil in Andhra. I only thought it would be nice to know. Vellairkai used for Vishu kani. hope you are enjoying summer..
Oh yes Sups! nOthing beats mum's cooking . Your recipe is new to me, but it looks lovely. Lovely presentation and worth a try!! I will just have to try it and make it for my sons tiffin box. 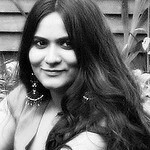 Have been reading your blog for several months, learning, loving and salivating. I'm so glad you are continuing to provide these lovely stories, recipes and pictures. I'm now going on a hunt for yellow cucumbers ! Can one substitute regular cucumber in this? Is the flavor of the yellow cucumber very different? It's called rotti because its texture is more like a rotti than dosa. and unlike dosas, it takes double the time to cook and it is cooked till both its sides turn crip. i have posted similar recipe for Rava/Semolina Rotti some maonths back and even that one is poured like dosa. Mangala, Sambar dosa? now that i have not heard of. do u have its recipe? @Keerathana, I can understand! the taste is quite different when u use yellow soute than usual cucumber isn't it? please pardon my ignorance but what is WP? and coming to your question about recognising individual indian cuisine, all i can say is it comes with experience and tasting everyone of them. even many Indians don't know much about regional cuisines. for many south Indians, north indian cuisines means naan, paratha, aloo matar, palak paneer etc and and north Indians think south Indian cuisine is all about dosa, idli, vada and sambar!!! Visit different blogs and you will notice that every blogger posts more recipes from the region they come from. Go through the recipes they post and you will slowly learn the difference in the way they cook from bloggers from other region/states from India. sometimes, there may not be much difference in the way they cook other than using different oils or using different spices/ingredients in tempering and other times, the cooking technique is totally different from others! As I said before, understanding comes from knowledge and experience! @Priya, I have mailed u the details. Curry Leaf, do share your recipe for soutekai thousali. @Vaishali, I have not tried it with other cucumber as the one I get here is sweet and too watery! But there is no reason why you can’t try with common ones. Make sure that you remove its skin and seeds. Taste wise yellow cucumber is very different to normal salad cucumbers we get. It has little hard flesh than the common ones. Oh lovely rottis Sia! 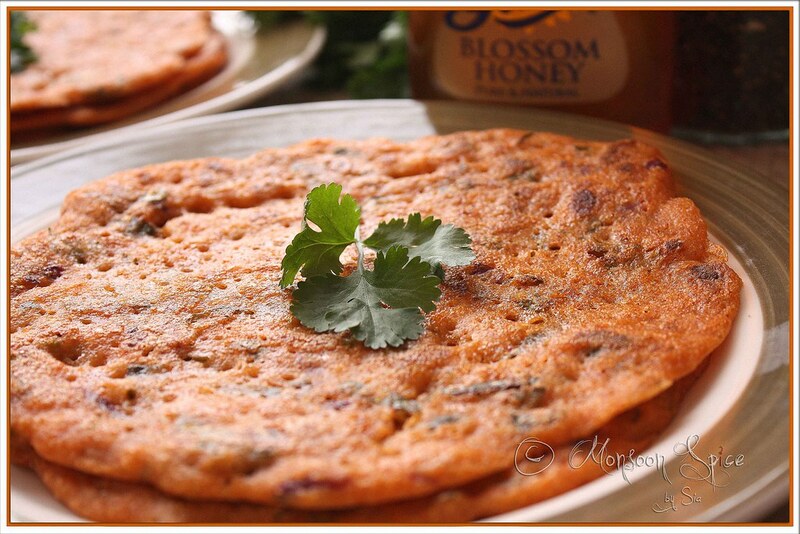 The bright color is so appetizing and what a taste you have by drizzling honey to this spicy roti ? My father used to have piping ot idlis mopped in honey! I love the distinct taste anyway! But in Chennai they sell stout small ones (in the siz of a large mousambi but yellow colored and smooth surface) as dosakai. Is that the same and just the shape differs ? Personally I would never presume to make a comment on how one cooks their own food...it is all related to how their family cooked it and quite honestly...everyone 'tweaks' it a bit here and there to make it their own. So who is to say what is the REAL 'this or that'....n'est pas? Grin. I love to hear how everyone makes their favorite food...this looks wonderful. I don't know what yellow cucumber is but I shall google and find out. Love it. And I do agree that your photos are amazing! 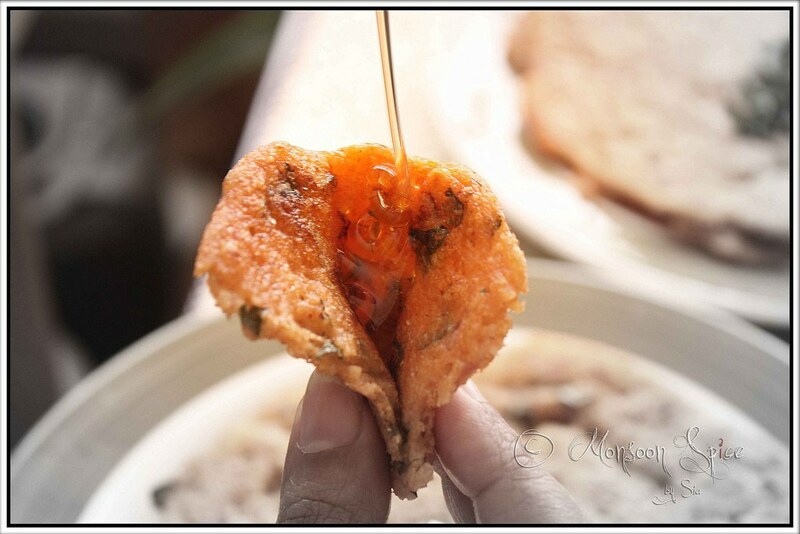 Rotti with honey...see...now that is new to me...love it! Finally, something I can make with the dosakai I keep seeing, which is not dal related! Looks yummy - thanks for posting! We call this veggie "vellirikkai" and use it a lot but never this way. I'm goign to try this for sure. @Nirmala, I think it's one and the same. I have seen some round shaped cucumbers which are sold as yellow cucumbers. This roti is new to me too Sia. We usually make dal with sorakaya and even pickle. I have to try this when I find it here. Take care dear. Leaving to India tomorrow. Thanks to your pictures i tried the recipe and ........... hold your breath everyone has enjoyed it.